How can you be sure that you choose the right countertop? They come in a variety of materials; the colors and patterns are almost endless. Whether you are looking for a clean look at a good price or an investment that will last a lifetime there is something for all tastes and budgets. In this section we will take a look at each and what they have to offer. In the end, you should select a countertop that is not only aesthetically pleasing but fits your families budget and lifestyle. 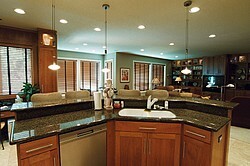 Marble, granite, soapstones and others are available for countertop use. Stone is a wonderful look that has the ability to last forever. Although some stones require periodic maintenance, they are a top choice for designers and architects. There is also a misconception about the cost of natural stone. It is an investment for sure and more costly upfront; but over time it will outlast almost all other materials therefore making it a smart choice financially with a greater roi (return on investment). Marble is less dense than granite and is sensitive to acidic foods including wines, ketchup, lemon and vinegar. This increased risk of staining makes it a poorer choice for kitchen countertops but a great choice for mantels and other decorative surfaces. By comparison, granite is the most durable natural stone. It is harder and denser than marble. This difference makes it an excellent choice for kitchens as it is highly resistant to staining, heat and scratches. Another sought after choice is soapstone. Its nonporous surface is impervious to acids and will not stain or burn. 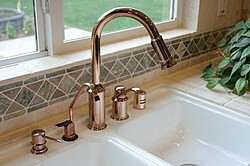 It also retains heat better than most other materials making it a popular choice for kitchen sinks. A new trendy material for kitchens concrete offers some creative input. From free form shapes and mutli-colors to the ability to incorporate functional features all can increase the beauty as well as the cost. Some of these functional items include integral sinks and drainboards. Unfortunately there is a misleading notion about the cost of concrete countertops. Many people start out searching for concrete as a low cost alternative to marble and granite only to be disappointed. They soon find out that this can be a mistake. Concrete can range in price from $90.00 to $250.00 per square foot installed depending upon what custom options are desired. There can be a cost savings if you do it yourself. Make sure you do yourself a favor and do your homework before undertaking this project. There are DIY kits that you can purchase that give you everything you need to create a fabulous concrete kitchen countertop. One thing is for sure; concrete can last a lifetime and are a worthwhile investment. Wood can add a warmth and sophistication to a room like no other material can. The varying grains and rich colors offer designers a whole new pallette of elegance to work with. If possible, it is best to go with harder woods such as Brazilian Cherry, Maple, White Oak, Ash and Beech as they will provide a longer life. There are others of the exotic type that are harder but also become very costly such as Teak, Tigerwood and Mesquite. It does however come with it's share of negative aspects. It must be maintained religiously. It will usually either have a mineral spirit finish or a tung oil finish. Mineral spirits are usually used in areas of preparation where food will be cut. Mineral spirits should be used in lieu of vegetable oil as it can go rancid over time. Tung oil is usually used in other areas. It is a more durable finish and is water proof. Tung oil is easier to maintain than mineral spirits but each has its use. Which ever type of finish is used, the goal should be to retain the moisture of the wood and keep surface moisture and food deposits out. Virtually maintenance free, engineered stone is impervious to staining like few other products on the market. Their hygienic state also makes them a food-safe choice. Contrary to some information out there; it is not recommended that you put hot pans on these tops. You may know them by their trade names such as Zodiac, Silestone or Ceasar Stone, but pre-engineered countertops are becoming very popular for their beauty, variety and durability. All of these quartz tops are resistant to heat and can withstand moderate temperatures for brief periods of time without being damaged. But as with any natural stone thermal shock is always a possibility and exposure to intense heat may cause cracks. 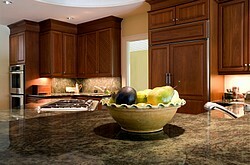 Note that these countertops are not necessarily a cost saving substitute for real stone. The man made tops run pretty much in the same price range as most natural stone tops. As with marble and granite, the colors are many as are the fine edge details available. So if you like a consistent look without veining, than a pre-engineered top may be for you. Until the emergence of quartz tops, solid surface tops were very popular alternatives to natural stone. Still a lower cost option but getting a tremendous amount of competition these days from the quartz tops. Sinks and backsplashes can be integral to the design offering a seamless look with the ease of maintenance. It does scratch and stain however but is able to be refurbished usually by using a scouring pad. It does not hold up well with heat so trivets and hot pads should always be used. Generally speaking, most solid surface tops are sold and installed by companies who have certified installers. This usually means that you can't order a custom counter and install it yourself. Once a very popular material, tile has really slipped into obscurity when it comes to counter tops. In part the emergence of new engineered man-made materials such as Zodiac, Silestone and others has forced the price of solid surface materials down. This new affordability along with the ongoing maintenance and fragility of tile has really made it not as popular and option for counter tops. This is not to say that it is still not an inexpensive option. This does not limit its appeal for backsplashes however. It's decorative qualities make it a great choice to integrate into any design. Once the predominate material used on kitchen countertops, laminate is also not as popular as it used to be. It's inability to last over the long haul and the pricing changes of other materials have made it less desirable. Aside from it being the least expensive material for tops, it also comes in an a wide variety of colors and patterns. Within the family of laminates, there are standard laminates and "color core" laminates. These laminates have the color all the way through instead of just the top layer. 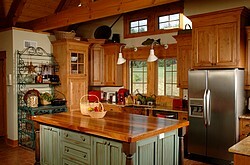 If looking at laminates for your counters you may want to consider color core as it will last much longer. Metal tops offer nice features such as a a stain-resistant, heat-proof and hygienic work surface. Don't be fooled into thinking that you will be getting what you see in a restaurant. Metal counter tops can be shaped into curved counters with integral sinks for a very customized look. 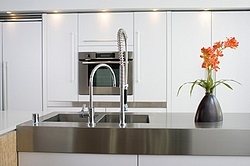 Stainless steel; long used in commercial applications, stainless steel has made a big leap into residential kitchens. They are a definite coordinator with today's popular stainless steel appliance fronts but they offer much more than that. Stainless is a hard surface that wears well over time. It also offers a very sanitary work surface. It's biggest down fall is the cleaning as it shows every fingerprint but there are a variety of good cleaners available. Another great benefit that almost gets forgotten when discussing metal counters is the reflective abilities. This can certainly be a great asset when trying to light a small kitchen that does not have a lot of natural light. The biggest negatives to metal are the fact that fingerprints show easily and require constant attention and they are cost prohibitive to many folks costing $50 - $75 per square foot for stainless and up to a $100 per square foot for copper not including installation. For a great look, try mixing metals. It can be done integrally with the countertop and backsplash, or with accents such as pot racks and other architectural elements. Don't miss out on updated information, new products and industry trends. Sign up for your FREE copy of the Remodeling Success Tips Newsletter. Click here to get yours now.